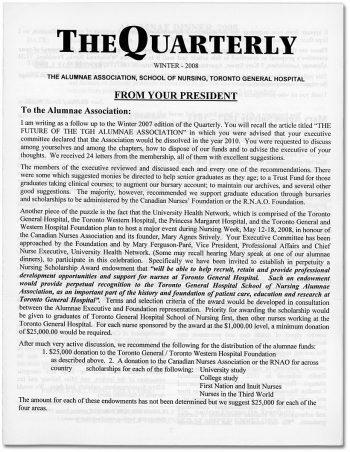 In the Winter 2007 edition of The Quarterly, the members of the Alumnae Association were informed that, after 116 years of continuous operation, the Association would be dissolved in the year 2010. They were asked to make suggestions as to what might be done with the funds. As outlined in an article in The Quarterly on the front page of the Winter 2008, edition, there were many excellent suggestions. And the members of the executive gave thorough consideration to all the recommendations. The majority felt that the best course of action was to support graduate education through bursaries and scholarships administered by the Canadian Nurses’ Foundation or the R.N.A.O. Foundation. Coincidentally, at around that time, the University Health Network, of which the Nurses Foundation was a part, was preparing to host a major event during Nursing week. The purpose of the event was to honour Mary Agnes Snively and the Centennial of the Ontario Nurses Association which she had founded in 1908. 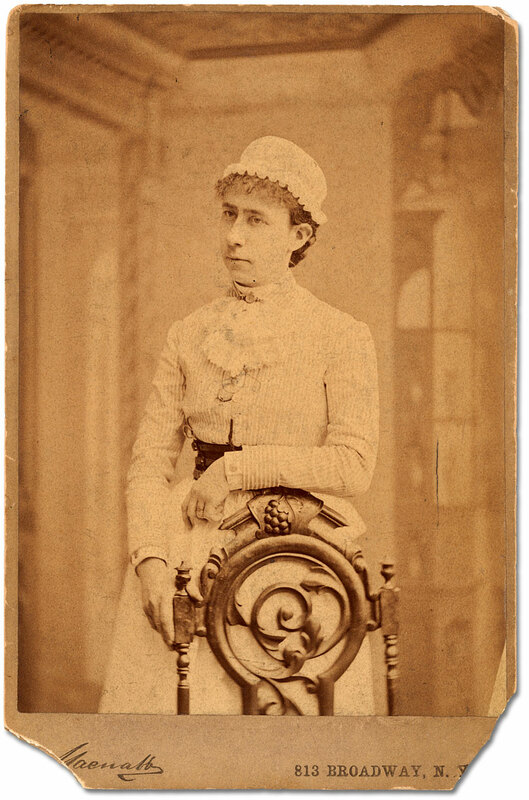 They invited the Alumnae Association to establish, in perpetuity, a nursing scholarship. be able to help recruit, retain and provide professional development opportunities and support for nurses at Toronto General Hospital. 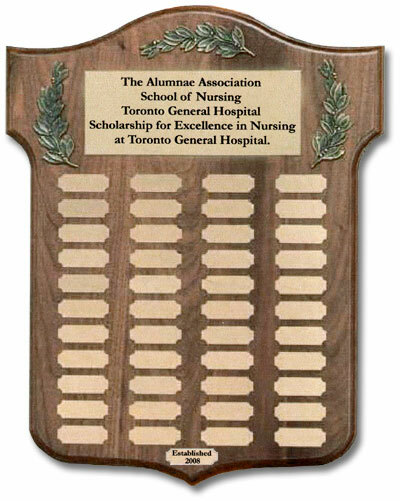 Such an endowment would provide perpetual recognition to the Toronto General Hospital School of Nursing Alumnae Association, as an important part of the history and foundation of patient care, education and research at Toronto General Hospital. The Alumnae Association readily agreed. 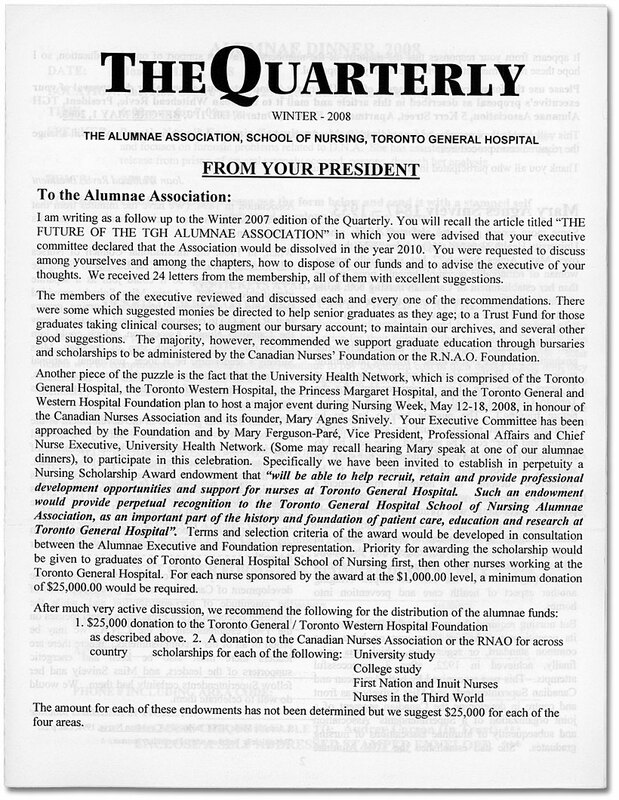 The award was announced as part of the celebrations and, during Nursing Week 2009, the Alumnae Association, School of Nursing, Toronto General Hospital Scholarship was announced for the first time. The first recipient was Salin Kim, an Advanced Practice Nurse Educator in the area of perioperative services at Toronto General Hospital, and a student at the doctoral level.She has a particular interest in the effect on patient outcomes of various models of care delivery.